HD Foundations Provides Pier And Beam Foundation Repair in Dallas, TX That Ends Issues. Learn Costs. Need pier and beam foundation repair in Dallas, TX? If so, enlist HD Foundations. We offer solutions to foundation problems. If you’re in the Dallas area, we can stop your pier and beam foundation repair issues. What’s more, we’re highly cost effective. So contact HD Foundations today. Why HD For Pier And Beam Foundation Repair In Dallas? Because we can restore your foundation to its original position. That stops deterioration. It also preserves your property value. Due to the clay soils and 100 degree weather associated with North Texas, foundations develop problems. and require foundation service. 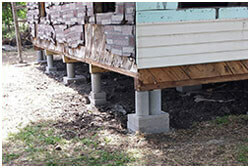 Homes, apartments and commercial properties have pier and beam foundation problems and commonly require repair. Sagging floors, foundation settling and, sinking become concerns. Crawl space damage is an issue, too. It’s best to end these problems on your Dallas house quickly. Learn what pier and beam foundation repair costs. You’ll discover that contractor fees depend on many things including the number of foundation piers that must be installed. Changing temperatures can have a negative affect on foundations. While the city has an average daily temperature of 76.8 degrees, the climate in the Dallas area can be well over 102 degrees in summer. Then, it will sometimes drop to 20 degrees in winter. 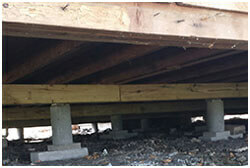 Heavy rains can seriously impact foundations constructed using piers and beams, too. These cause foundation damage and sloping. Because repairs are often needed on Dallas houses, it’s a good idea to study common problems with pier and beam foundations. For more information, contact HD Foundations. The first step in ending the issues affecting your Dallas structure is to have your foundation evaluated. Find out what it will cost to fix. You’ll discover that fees for repairing pier and beam foundations are based on a number of things. If you have severe deterioration and require a great deal of material and labor, the cost of fixing your foundation will be higher than if you have minimal settling. It pays to end foundation issues quickly. The longer deteriorating conditions are neglected, the more costly it will be to fix your foundation. As recognized pier and beam foundation repair contractors in Dallas, we commonly install pressed concrete foundation piers and steel pilings. They’re part of our house leveling process. If you have trouble, contact HD Foundations to get a no-cost appraisal on foundation damage. Pier and beam foundation issues include settling, squeaky floors, cracks in walls and ceilings, misaligned doors and damp crawl spaces. When water does not drain correctly, the wooden beams and piers supporting your home can rot and develop mildew. If so, you may require a foundation drainage system. At HD Foundations, we install them. If you’re having problems, contact us for a foundation evaluation anywhere in the Dallas metroplex. It’s easy to schedule a free pier and beam foundation repair estimate online today. We service residential and commercial properties.